A couple of weeks ago, I asked each student to pinpoint something that he or she had learned in a recent class, something that was particularly resonant. Aleme Chitanje shared an idea she had learned from Tim Hurson's book, Think Better, which the students are reading in Professor Karl Elder's class, Means for Mastery of Reading Pedagogy. I saved her comments because I wanted to devote at least one post specifically to the Hurson book. "One thing I learned," wrote Aleme, "is to let go of patterning, or 'Breaking the Elephant’s Tether' [as Hurson calls it]. Patterning refers to making decisions or doing things by following routines without making inquiries about whether the old way really works or not. This is one of the problems that we have as teachers [in Malawi]. Often times, we follow and use teaching strategies that we clearly know are not helping our children learn, but we follow them anyway because 'it says so in the book,' [or] 'that’s how I learned it in college,'[or] 'the principal or the head teacher said so,' or 'everybody else is doing it that way.'" As he did for Cohort 1, Professor Elder has introduced the graduate students of Cohort 2 to the book Think Better. In it, Hurson talks about how to let go of old ways of thinking, and he lays out a compelling plan for how to solve problems better by using "productive thinking." Similar to last year, the book is creating a stir among the students and is the basis for some very interesting discussions. A week ago, the students were asked by Professor Elder to bring 25 "itches" to class. An "itch," as Hurson describes it, is a problem that has been bothering someone for a while. It is something that has proven itself to be difficult to solve. This week, Professor Elder had each student look at his or her 25 itches and pick five that were the most "itchy." From those five, each student selected two to put up on the chalkboard. The list included problems from "large class size" and "lack of creativity in teaching" to "lack of parental involvement." The 22 items were then categorized in three groups: economic issues, professional issues, and administrative issues. In the coming weeks, the students will continue to work on their combined list of "itches," seeing how some problems are linked to others and which problems teachers in Malawi might have some control over, even in the most challenging of teaching conditions. As Aleme wrote, "If [we] can learn to think better and be focused on what we are doing and the effectiveness of our ways of doing things, I believe we are going to achieve great results and things are going to change for the better." MaryFlorence Mzama captures all the "itches" identified by the group. It is mid-September and Lakeland students, faculty, and staff are a few weeks into the 2015-2016 academic year. The Malawian graduate students, like others in the campus community, are beginning to settle into a regular routine of classes, study, and more study. Every other Friday, the graduate students meet with Professor Jeff Elzinga to share how things are going for them, solve any glitches or challenges they are facing, and learn about upcoming events on campus and in the wider community. At the most recent bi-weekly meeting, there was discussion about logistical matters: where to print documents on campus, how to change computer passwords, the schedule for the shuttle van that goes into Sheboygan, and the need to provide medical records to the school nurse. Professor Elzinga also talked about the Global Students Association (GSA), which is a campus organization that serves the needs of international students. Some of the Malawians were familiar with the group and had already made contact. Professor Elzinga explained that there are two main events sponsored by GSA each year. One is the International Food Fair, which will take place this year on Saturday, October 24. For the Food Fair, Lakeland's Dining Services staff helps groups of students from different countries join together to prepare traditional dishes from their homelands. The Malwaians typically make nsima, rice, fish, and either beef or chicken, along with a cabbage relish. More than a dozen dishes from around the world are prepared by international students and then sampled by other Lakeland students, faculty, staff and area community members for a small fee. The other major GSA event each year is International Night, which is staged in April. International Night is a performance-based evening that showcases the singing, dancing, and other artistic talents of Lakeland students from around the world. Both of these GSA experiences are among the most popular events on campus each year, and students from Malawi have participated in them for more than ten years. During the most recent bi-weekly meeting, Professor Elzinga encouraged the M.Ed. students to consider joining a campus organization such as GSA, or, for example, choir, if they like to sing, or band, if they play a musical instrument. Mike Kumwamba mentioned that he had joined the choir when he was an undergraduate at Lakeland and had a great experience singing with the group and traveling on choir tours in the Midwest. Lakeland offers many organizations that benefit students by providing extra-curricular opportunities to learn and engage with others. After the recent meeting, I asked the students to share with me some things they are finding surprising or interesting about life in Wisconsin. I received answers like "American students wear caps and short trousers in the classroom during learning time," "people here observe time strictly," and "there is [free] Internet Wi-Fi in every room on campus." I also heard about new and exciting ideas the students have been learning in their classes, but I’ll save those comments for another blog post. Regarding host families: Anyone in the surrounding community can serve as a host to "watch over" an international student and occasionally invite him or her to experience a dinner, family gathering, or off-campus event, especially during the holidays. If you are reading this blog, live near Lakeland College, and have an interest in serving as a host family to a student from Malawi or anywhere in the world, please contact Ryan Opahle, Assistant Director of Residence Life at . 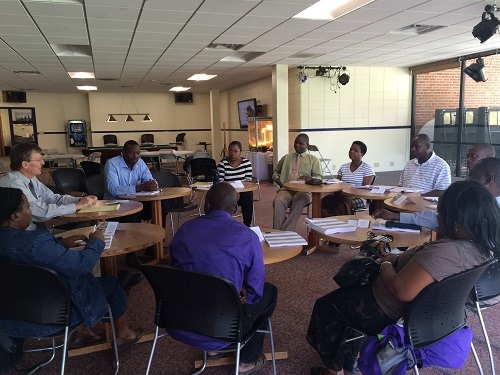 On August 10 and 11, Lakeland College hosted a pair of workshops at Ufulu Gardens, a new conference center in Lilongwe, the capital city of Malawi. 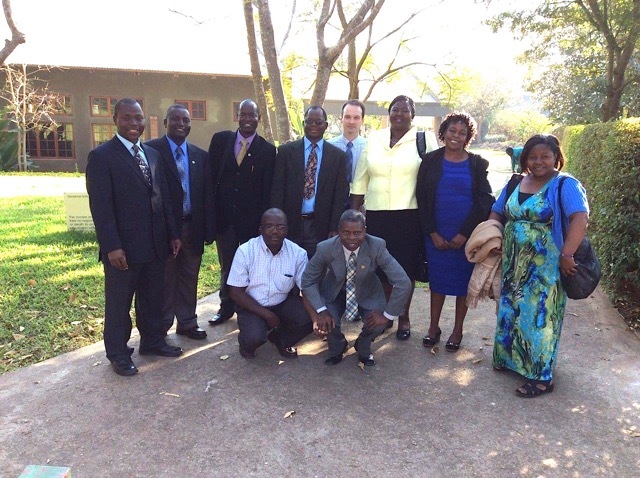 Two Lakeland faculty members were in Malawi to facilitate the workshops, Dr. Joshua Kutney and Dr. Brian Frink. 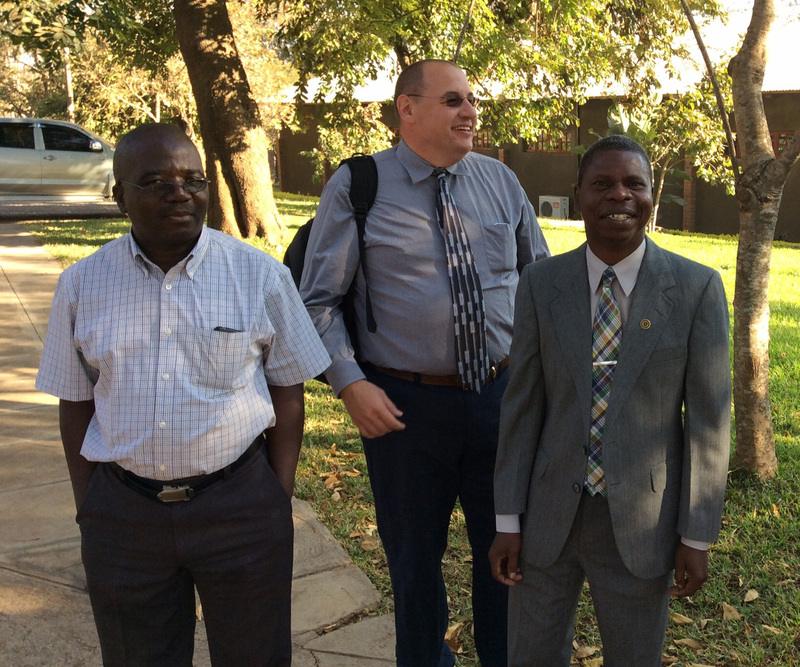 While Dr. Frink had been to Malawi twice before, it was Dr. Kutney's first trip to the country. He offered these observations of the experience through an email interview. LV: What was the purpose of the workshops? 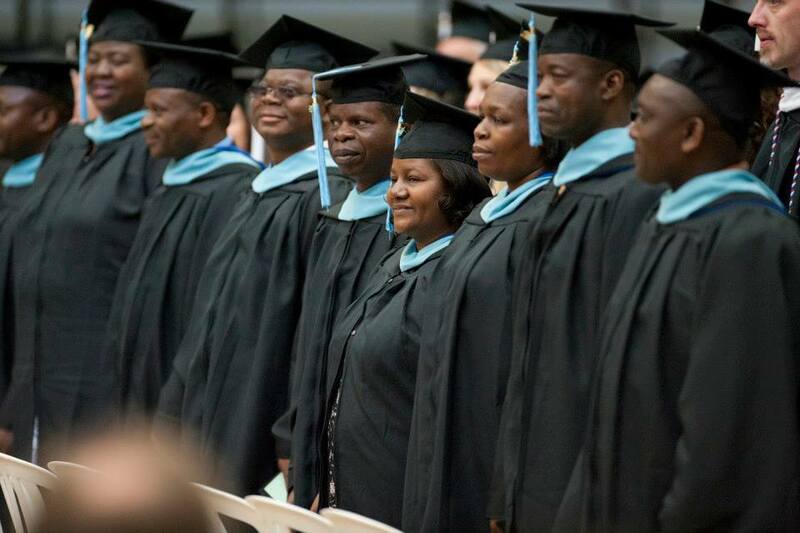 JK: The primary goal was to provide the first cohort of Lakeland graduate students with information about current efforts to improve early-grade reading instruction in Malawi. In turn, we hoped that the students would learn about some of the ways that their newly developed expertise might be used to improve literacy among Malawi’s youngest school children. LV: What transpired during the workshops? JK: On the first day, students met with Mr. Douglass Arbuckle, Mission Director of USAID in Malawi. Afterward, they enjoyed a thoughtful session on Early Grade Reading Assessment (EGRA) with Dr. Paula Green and her colleagues at RTI International, a non-profit institute that provides research, development, and technical services to government and commercial clients worldwide. On the second day, the students heard presentations from an important cross section of stakeholders in literacy development, including NGOs, educational institutions, donor governments, and the government of Malawi. At the end of the second day, the students had an opportunity to discuss their graduate work, with the aforementioned attendees commenting on avenues for integrating this work into the existing framework of approaches and initiatives. LV: What do you think was the biggest take-away for the Lakeland students? JK: The students learned a great deal about the different types of literacy initiatives that are operating in Malawi, including instructional approaches and resources, efforts to improve community involvement, and changes to teacher training materials and procedures. As a result, the students are better informed about the ways that different stakeholders are attempting to address the early-grade reading problem. The students have a better understanding now of the challenges confronting stakeholders as they navigate issues of assessment, school attendance, and resource availability. LV: What lies ahead for the students of Cohort 1? JK: The next step for Cohort 1 is to run their research studies and to complete and defend their theses. That is their primary goal at this point. From there, the students will need to continue to work closely with their respective TTCs to improve the way teachers are trained in reading instruction. I think our students will be able to provide valuable input in suggesting ways to evaluate the impact of that training. LV: What did you take away that might impact your work with the students in Cohort 2? JK: I think it is very important for Cohort 2 to be aware of the various initiatives to improve early-grade reading. We plan to communicate our findings from the workshop to the cohort and, as much as possible, any materials that attendees were willing to share with us we will pass along. There is an exciting landscape of work happening in Malawi that our students need to become familiar with as they begin to strategize how to improve literacy rates. LV: In what ways were the workshops successful in meeting their goals? JK: The workshops introduced our students to many of the stakeholders in the early-grade reading movement. The students also had an opportunity to share the details of their training with these stakeholders. The dialogue was rich, leaving our students with a much clearer sense of how they might help to improve reading instruction in Malawi. LV: What did you take away overall from your first visit to Malawi? JK: As this was my first trip to Malawi—and to Africa—I learned a lot simply by undertaking the journey. It’s a long way to Lilongwe. I am extremely grateful to Dr. Brian Frink and Mr. Patrick Tembwe for their guidance throughout the trip. I know much more about the culture and customs of the country as a result. In fact, by the end of the trip, I had perfected the Malawian handshake and was slightly more practiced in the etiquette for eating nsima, a maize-based porridge traditionally eaten with the hands. I still remember the surprise on the students’ faces when I first tried to eat nsima with a knife and fork. I also experienced the kindness, generosity, and sincerity of our colleagues in Malawi. It is clear how invested they are in improving literacy in the country. There is a great deal of work to be done, but based on the workshop sessions and our visits to the TTCs and Mzuzu University, I am optimistic about the future. I was impressed and proud to see what a superb reputation Lakeland College has developed in Malawi. This week, we complete the introductory profiles of the Malawian graduate students in Cohort 2. Meet Nancy Nyirenda and Yowasi Nkhambala. Nancy Nyirenda began her teaching career in Karonga in 1991 at a primary school. In 1997, she was assigned to work at the secondary level and earned a teaching diploma from Domasi College along the way. In 2006, Nancy came to Lakeland to pursue her bachelor's degree in general education. Very soon after graduating and returning home, she was posted to the Teacher Training College in Kasungu. She worked there until her departure this year for the Lakeland M.Ed. program. When she returns home a year from now, Nancy already knows she will be heading to a new post, this one in Chiladzulu, where a new TTC has just opened. Nancy is excited to be back at Lakeland and finds that the campus does seem different to her. "It’s better than ever," she said. She finds the new front entrance especially beautiful and appreciates all the upgrades in the dining hall and the campus center. Nancy had three choices for graduate programs earlier this year: Nottingham in England, Chancellor College in Malawi, and Lakeland. She said it was easy to choose Lakeland for many reasons, but mostly because of the high quality of the education and the support provided by the USAID grant. Nancy was widowed in 2001. When she left her three sons at home in 2006 to come to Lakeland the first time, her boys were ten, eight and five. At that time, they were supervised by her siblings. Now the boys are grown up, ages 20, 18 and 15. When Nancy's sons heard she had the opportunity to return to Wisconsin, they encouraged her whole-heartedly. She recalls them telling her, "Mum, go to Lakeland College. We will stay quite well even in your absence because God is with us. He was able to take care of us when were very young when you went there. Since God is the same yesterday, today, and forever, He will continue the precious work He started with us. So use this chance!" She is glad to be back at Lakeland and glad to know that she has the support of her loving family. Nancy is keen on working with other teachers and administrators in Malawi to incorporate reading through all the content areas. "Even in mathematics," she said, "there are words to be read. We need to collaborate with our colleagues and spread the word. We must focus on one goal, to improve early grade reading." Nancy's goal for herself while at Lakeland is to "improve my teaching skills. I will really be a teacher who will make a difference." Yowasi Nkhambala lives in Blantyre with his wife, who owns a clothing and cosmetics shop. They have four daughters ages 25, 23, 18 and 15. Yowasi teaches now at the Blantyre TTC, but he began his teaching career 25 years ago in Thyolo district at St. Joseph Primary school. He taught there for five and half years before being posted to a secondary school where he became head teacher, the equivalent of principal. He went to Domasi College at that point to obtain his teaching diploma, continued to teach at the secondary level, and eventually went to Domasi for his bachelor's degree. Even prior to receiving his degree in 2009, Yowasi had served as head teacher at several secondary schools: Makapwa, Lipho and Luchenza. He said "I am hard working and have leadership skills, so even though I was not fully qualified at first, I was trusted by the administration." Yowasi was pleased to report that because of high scores in learning outcomes in languages when he was working there as the lead teacher, Luchenza School was selected in 2006 to participate in a study that was examining best practices in teaching languages. "What I learned from that experience is that working hard really does pay. It was an honor to have our school recognized for its examination results and it motivated the entire school to stay focused and someday, hopefully, achieve even more." Yowasi said that he'd heard a lot of excellent reports about Lakeland College before he came here. Now that he is here, he says that what he is experiencing far exceeds his already high expectations. He remarked in particular about the commitment of the professors, the quality of the instruction and the exposure to new teaching methods. 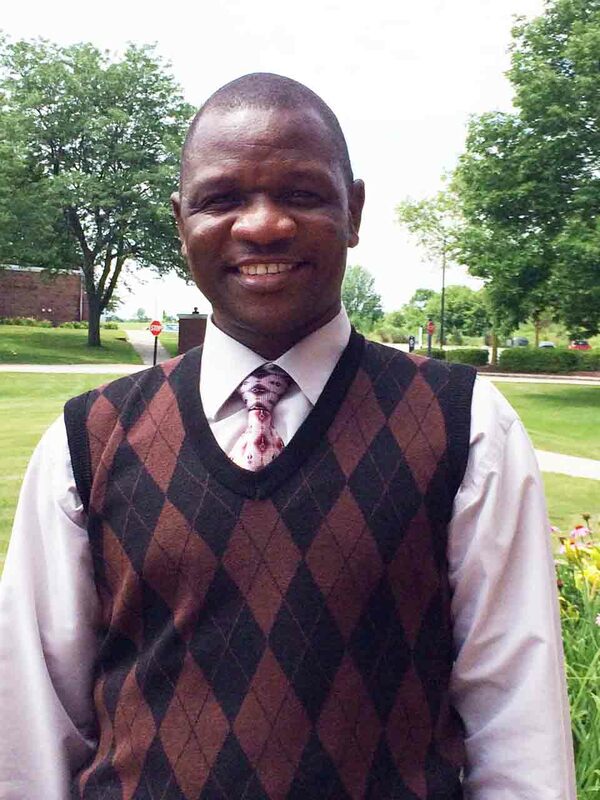 "My wish," he stated, "is to acquire all this new information [offered by Lakeland College], so I can truly make a difference in our educational system in Malawi." This week, we meet Mary Florence Mzama, Henderson Ngwira, and Margret Mandala. Mary Florence is from Blantyre but now works at the Teacher Training College (TTC) in Lilongwe. She has five children; two girls, ages 16 and 17 and three boys ages 14, 5, and 13 months. Mary Florence began her career in teaching at Lilongwe Girls Secondary School in 1997, and from there went on to the Montfort TTC where she worked for four years. From Montfort in 2002, she moved to the TTC in Lilongwe. Mary Florence first heard about the Lakeland Program, "a long time ago," she said. "After finishing my degree in secondary education, when I went to Montfort, people were [already] talking to me about Lakeland College." In fact, when the opportunity arose to apply for the first graduate cohort in early 2014, Mary Florence applied. "But, I was about to give birth to my fifth child, so it was not a very good time to leave for America!" Now that she is in Wisconsin, she is excited about her studies and eager to learn new ways to keep teachers motivated and engaged in improving learning outcomes for their students. "Sometimes, things fail because of the curriculum," she said. "And a lot of times, things fail because of lack of materials. But there are teaching methods and strategies that can help teachers when they are up against so many challenges, and I have come here because I want to be trained in these strategies. I am glad to be in the pioneer group." When Henderson began his work as an elementary teacher in 1994, he actually had been preparing for a different career, one in the military. He expected that his time teaching was going to be temporary. But, the military option did not pan out, and in 1997 he sought additional training at the TTC in Kasungu. By 2001 he had moved to teaching at the high school level. Eventually, he received a scholarship to complete his BA at Domasi College. In 2009, he was posted to work at the TTC in Karonga, where he lives and works still. He and his wife have six children, two boys and four girls. Like Mary Florence, Henderson applied for the first Lakeland M.Ed. cohort in early 2014, but he realized that his computer skills were not up to par. Instead of being discouraged, he used that first application process to guide his efforts to improve himself so he could apply again for Cohort 2 and be successful. His efforts paid off. "Lakeland is a good place to get an education," he said. "It is quiet, there are no city distractions. I like this place and I know I will learn a great deal while I'm here." Like his colleagues, Henderson notes that in order to improve early grade reading instruction in Malawi, much needs to happen in terms of the curriculum, the reading pedagogies used, and the training of teachers. "Another thing is that there must be involvement of parents, teachers, and community leaders to support reading. There has to be a kind of civic education, to bring the community together." He also was clear that there is much to learn this year. "You have to know what you don't know," he said. For example, the research skills he will learn at Lakeland, he believes, are going to be a huge help to him and to the greater community. Margret began teaching in primary school in Dowa, the place where she was born. She moved to Salima with her husband and four children and taught there until 2001. In 2002, she began her training to become a secondary school teacher, completing that diploma in 2006. She was first posted to Zingwangwa Secondary School and taught there until 2008. When offered the opportunity to get her bachelor's degree, she jumped at the chance. She graduated in 2010 and was posted to the TTC in Blantyre in 2011, where she has worked ever since. Margret knew about Lakeland College because many of her colleagues talked so favorably about it. "It is a place where people [who want to learn about teaching] go," she said. "Bertha Singini [from M.Ed. Cohort 1] kept encouraging me to apply. 'Don't give up,' were her words. I'm very grateful to Bertha." As far as what needs to happen in Malawi to improve early grade reading instruction, Margret said, "We need to introduce strategies that are effective. Teachers know about the strategies, but don't always know how to use them. We need to promote a culture of creativity in teachers. The moment we graduate and become qualified, we [tend to] relax. We have reached our goal. But, that is the very time to push our creativity, to do even better." Margret looks forward to completing her studies at Lakeland and then to go home with new energy to implement creative new strategies that will lead to positive outcomes. "When I go back, I hope to be an effective agent of change. At times," she added, "a person dreams of change. One must learn to be effective in that dream." All of the graduate students in the current cohort know someone who was a student in Cohort 1 because they all work together at Teacher Training Colleges (TTCs) throughout Malawi. In fact, some of the students in the current cohort were even trained by someone from a previous cohort. Also, there are individuals from the very first cohort at Lakeland in 1999 who have had a lasting effect on the students who are pursuing their master’s degrees now. 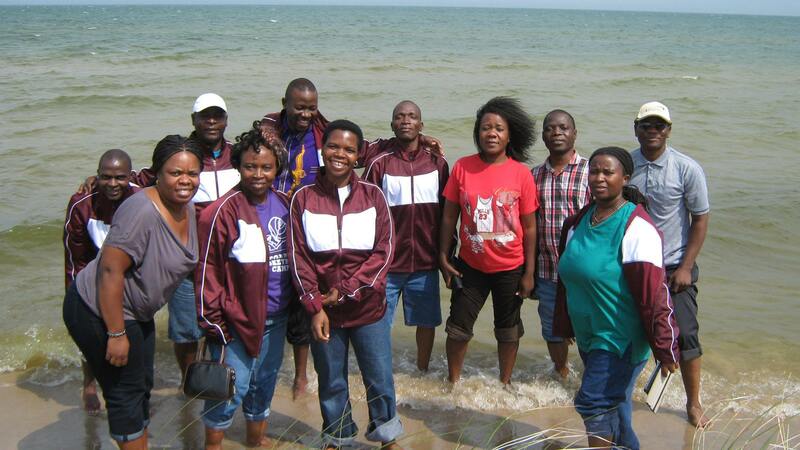 Who knew that these first individuals, who came to Lakeland more than 15 years ago to receive their bachelor’s degrees, would play such a lasting role in the development of Malawi’s corps of teachers? Two of the four current students who received B.A. degrees at Lakeland are Alemekezeke Chitanje and Elizer Kalilombe. Alemekezeke Chitanje (Aleme) graduated from Lakeland with a degree in general education and two minors, one in history and the other in gender and ethnic studies. She lives in Lilongwe and is employed at the TTC there. Her husband is a chaplain for the Malawi Prison Service and was recently transferred to Blantyre. They have one fourteen-year-old son who is in boarding school in Lilongwe. When Aleme graduated from Lakeland in 2012, she remembers wishing that she might return someday to pursue a master’s degree, although she wasn’t quite sure how that would happen. “Lakeland College is like my second home. Being here again is a dream fulfilled." “My goal,” she said, “is to be equipped with strategies to teach second language acquisition teachers to teach children how to read. I have high hopes that [what I learn here] is going to work." Elizer Kalilombe lives in Blantyre and works at the TTC there. She has three children: a boy who is 18, a daughter 13, and the youngest, a boy age two and a half. 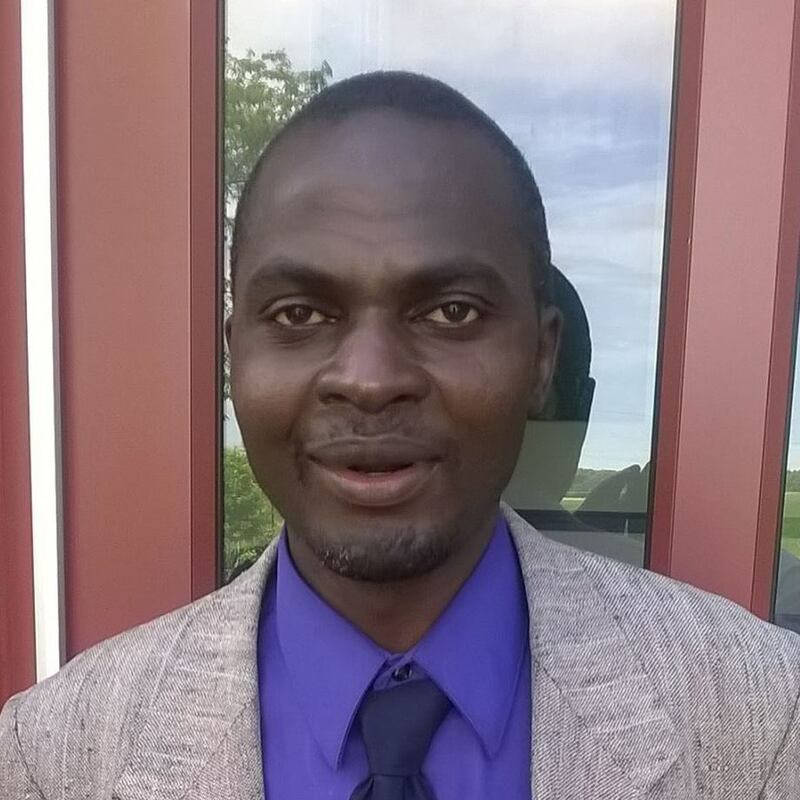 Elizer taught primary school from 1997 to 2006 at three different schools in Malawi’s central region. She then entered the bachelor’s program at Domasi College of Education, but after her first year there, she learned that she had been awarded a scholarship to come to Lakeland. She arrived on campus in 2008. Upon returning home, Elizer started teaching, first in a high school in Blantyre and then as a teacher trainer at the TTC there in May 2014. “When I graduated in 2011, I hoped I would come back to the U.S. for my master’s degree someday, but I did not imagine it would be at Lakeland College.” She is very pleased to be back at her alma mater. Like Aleme, Elizer talked about the inspiration provided by Andy Mwanyongo, especially because of his incorporation of music into the TTC curriculum. In addition, she referred to another important Lakeland alumni mentor from that long ago first cohort, Dr. Sellina Kanyerere-Mkweteza. “She taught me at Kasungu TTC,” Elizer shared, “and the way she was teaching, the way she spoke, she was the best. Her methods, her manner.” Then Elizer added, “They both inspired me and encouraged me. I try to model myself after them for my students." 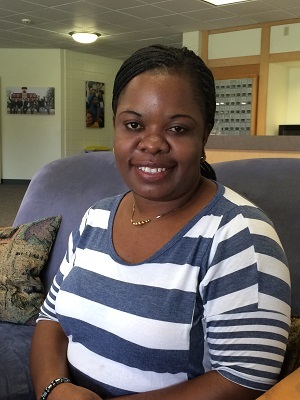 When I asked what she feels needs to happen to improve early grade reading in Malawi, Elizer said, “After finishing just our first two courses here, I can see that it is reading strategies we need to work on. I can see now that one problem in Malawi is that we do not do content-based reading. We must incorporate reading strategies into every subject area. We also need to work on assessment. We need to know [and monitor] the reading levels of our learners." Elizer and the other women faced quite a challenge during their first week at Lakeland. A cooking fire started in their kitchen, and despite their best efforts, the fire quickly got out of control and destroyed the residence hall. Thankfully, everyone got out of the building unharmed, although Elizer did have burns on her hand and ankle, and they lost all of their personal possessions, including new laptops and textbooks. I asked her how she was feeling about all this. “We are adjusting. We ask ourselves, ‘why did this happen?’ but there is no good answer. It happened. People have been very kind. We have learned a lot about the goodness of people in America, and here at Lakeland College. They are very supportive. When a person is in trouble, the faculty, staff, and students, everyone comes together to help. We are very grateful." In closing, Elizer said regarding her hopes for her time at Lakeland, “I will work hard. I will make sure I bring the best things back with me to improve reading in Malawi." Last week, the students of Cohort 2 completed their first two graduate courses, and as described below, the material has them thinking deeply about reading instruction in Malawi . This week, they have a break from regular classes, but are in sessions with Dr. Bidemi Carrol, a consultant from Washington D.C. who will talk with them about early grade reading instruction in developing countries. The week also holds off-campus opportunities. The students will visit the Early Bird Rotary Club of Sheboygan, the service organization that provided them with welcome baskets of bedding, toiletries, and other personal items when they arrived. 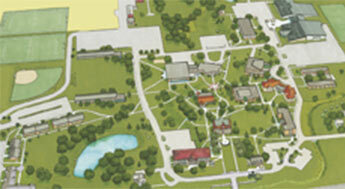 They will also explore Bookworm Gardens, the interactive reading park for young children in Sheboygan. I look forward to sharing their impressions of this unique place for young readers in a future post. Today, let me introduce Edson Dzimwe and Mavuto Chiwale. Edson lives and works in Machinga. He and his wife, an elementary school teacher, have four children, a 15-year-old girl, 8-year-old twins (a boy and a girl), and a 3-year old boy. At the Teacher Training College where he works, Edson teaches two subject areas: English and Chichewa. Before becoming a trainer of teachers, he worked for five years as an elementary teacher at Chigodi Primary School in Lilongwe. It was through working directly with young children that he gained a deep understanding of the many struggles with reading that children in Malawi face, and the challenges teachers have in assisting them . Mavuto lives in Blantyre with his wife, an elementary school teacher, and their two boys, one 7 years old and the other just 18 months. In the coming weeks, the blog will introduce each of the eleven graduate students of Cohort 2. We begin with Mike Kumwamba, who received his undergraduate degree from Lakeland in 2007, and Frank Mbwana who is in the U.S. for the first time. Mike reminisced about the many important things he had learned during his undergraduate years from professors like Khodavandi, Hilke, and Elzinga. He spoke highly of all of them and has tried to impart to his students the many lessons he learned here. First and foremost, he learned from Dr. Khodavandi that the teacher is a model for the learner. “If the teacher misbehaves, the learners will follow suit,” he said. Mike knows that the learning he will do at Lakeland is going to be condensed and very challenging. He said, “I believe that perseverance pays. Sometimes it looks like the fight is not going your way, but like it says in the Bob Marley song, “You can get it if you really want it.” He is confident he is up to the task of obtaining his master’s degree in education in order to bring new knowledge about early grade reading instruction home to Malawi. Before being posted to Phalombe, Frank worked in Kasunga for six years. Prior to that, he was a primary school teacher for nine years and then a secondary teacher for four more years. It was at that point that he went to Domasi College in Malawi to receive his BA degree and become a teacher of teachers. I asked him what his first impressions are of Lakeland. He replied, “For me, this is an ideal college. Even though I have been here a very short time, I can tell that being out in the country, it is a setting that allows students to focus on their work.” As far as what made him want to come here, he said he has always wanted to travel outside Malawi. He also pointed to the example of his friend and co-worker Ndamyo Mwanyongo, one of the graduate students in last year’s cohort. “She inspired me a lot,” he said. When I asked Frank what his hopes are for his time at Lakeland he said there are two things. First, he wants to successfully achieve his masters degree. Second, he wants to be instrumental in helping to bring about change in Malawi to improve early grade reading instruction. Frank reported feeling very at ease and happy to find that people are kind and helpful in Wisconsin. Whereas Mike recognizes Lakeland as a “home away from home,” having been here before, Frank has a slightly different take on it. Feeling the warmth and friendship extended to him by new friends, Frank described Lakeland as “a home in another home.” However one describes it, Lakeland is certainly that, a home to many of us, near and far. This blog is called Takulandirani, which means “welcome” in Chichewa, Malawi’s native language. Lakeland College is pleased to say “takulandirani” to the second cohort of graduate students, who began their stay in Wisconsin on June 12, 2015. Only two days after Cohort 1 had left campus, Cohort 2 arrived to begin their year of intense graduate study in the Masters of Education program. It was not long before they found their way to Lake Michigan to enjoy the sun, sand and water. Like their predecessors, the members of the new cohort are committed to improving early grade reading instruction in Malawi. I had the opportunity to speak with four of them last week: Mavuto Chiwale, Edson Dzimwe, Mike Kumwamba (Lakeland College B.A. graduate of 2007), and Frank Mbwana. All shared how energized they are by the opportunity to gain knowledge at Lakeland. All are passionate about education and their purpose in being in the graduate program. Indications so far are that the group has eagerly jumped into their first two courses: ED741 Reading in the Content Areas and ED790 Literacy and Second Language Acquisition. Along with Mike Kumwamba, there are three other students in this cohort who received their undergraduate degrees at Lakeland. They are Alemekezeke Chitanje, Elizer Kalilombe, and Nancy Nyirenda. As Mike reported, for them, coming to Lakeland is like returning home. The other members of this cohort are: Margret Mandala, Mary Mzama, Henderson Ngwira, and Yowasi Nkhambala. All eleven previously worked as teacher trainers at one of the seven teacher training colleges (TTCs) in Malawi. Four are from the TTC in Blantyre, two are from Lilongwe, two are from the newly-opened TTC in Phalombe, and one each is from Kasungu, Karonga, and Machinga. Before leaving campus for the final time, the students in Cohort 1 founded a group called the Forum for Reading Education (FREE) to help them network with colleagues throughout Malawi. The forum has a Facebook page, which already has 167 “likes.” Please look at it and “like” the page so you can keep up with the activities of the group. This page will also be where students in Cohort 1 and students in Cohort 2 can share ideas with each other. In addition to FREE, an advisory board was formed to support the work that FREE will undertake. Lakeland faculty and staff members serve on this board, and they are joined by two of the adjunct reading specialists who taught in the M.Ed. program last year. The purpose of the board is to provide advice and direction to FREE in its efforts to improve literacy and reading in Malawi. The graduate students of Cohort 2 say they are looking forward to an amazing year. In the coming weeks, follow this blog to meet each of them in more detail and to witness how they are faring, what they are learning, and what they plan to do to support the improvement of early grade reading instruction in Malawi. The graduate students of Cohort 1 are getting ready to return to Malawi and will leave the U.S. on June 10. Because so much of their experience at Lakeland relating to professional development has been shared on this blog I thought it might be interesting to ask them some different kinds of questions to bring this academic year to a close. This is what I asked: “What differences or commonalities have you observed between cultures in America and Malawi? What have you learned about yourself in this past year, living so far from home? How have you changed?” Here is what the graduate students shared with me. As Margaret Mulaga pointed out, there are many differences in dress, food, and traditions when comparing the U.S. and Malawi, but there is one “important commonality,” she said, “that is the friendliness of the people.” In Malawi, she reminded me, people are very welcoming. In fact, Malawi is referred to as the “warm heart of Africa” for this very reason. But people in Wisconsin also showed a warm heart. The hospitality and kindness shown by everyone here helped Margaret get past her initial challenges, she said, past everything from not liking cheese (she has since grown accustomed to it) to feeling homesick. Overton Simbeye said that he too had a problem with cheese in the beginning. But now, he will miss it. And hamburgers. He also remarked on the wonderful visits he has had with this host family this year and the variety of experiences that he might never had had otherwise. In fact, every student mentioned his or her host family and the warmth and generosity of spirit that has been shared in so many homes, backyards, parks, and on trips to Milwaukee, Oshkosh, Chicago, and elsewhere. Elymas Tembwe said that during his year in the U.S. he has become aware of the value of having a sense of humor, and of being direct and open. He said, “People here [in the U.S.] are very free to interact . People are not closed. They come to you open.” He appreciated this American tendency to be more direct in speech, in planning, and in action. He felt it was something he had found in himself that could be put to good use in Malawi, where people generally tend to approach things more indirectly. Benjamin David said that the most important thing he has observed here time and again—in his professors, his fellow students, his church members, and his host family—is that people in the U.S. have what he called “a hard working spirit.” People here strive for things, develop personal goals, and then work to meet them. He said, “At home [in Malawi], the majority of people rely on goals made by others,” and it sounded as though Benjamin is determined to bring what he has learned at Lakeland to change that back home. Ndamyo Mwanyongo, who received her undergraduate degree from Lakeland in 2008, shared that she feels she has “grown up” this year, becoming more confident in herself. As she walked across the stage at the May 3 Commencement ceremony, she was reminded of a motto that she learned at Phwezi Girls Secondary School: “Accept the challenge, God will guide.” It is something she has said to herself many times in her life, and now, it has new meaning for her. Like all his friends, Michael Simawo said he has learned and grown a lot over the past year. He was grateful to have experienced in person the extremity of all four seasons , not just through movies or photographs. He also observed that “people here prioritize what belongs to the group, putting the group first.” It is interesting to note that while some of us might describe American culture as “me first,” Michael actually witnessed many signs of the exact opposite. Bertha Singini had some especially difficult challenges here this spring. In March, she lost her beloved father in a bus accident in Malawi. Soon after that, she found out she had a mass in her throat, pushing on her wind pipe, which needed to be surgically removed. The mass was removed just ten days before graduation, and fortunately it was not cancerous. Bertha proudly walked with her cohort in the ceremony. She said to me, “It is a fact that I got better medical care here than I would have at home.” Bertha got through all this with her strong faith in God and the kindness of her friends. She is happy to be going home, but knows she will miss everyone here. She is grateful for email and Facebook. I will end this post with the observations of Phillip Nachonie, who graduated from Lakeland in 2006. Phillip shared how impressed he has been by the amazing passion that Wisconsin teachers have for education and for their students. He observed at various elementary schools that teachers really work over and above their duty to ensure that their students learn, and he hopes to bring this kind of commitment home to Malawi with him. The graduate students wish to thank all of their professors and the staff of Lakeland College for an amazing year. They also would like to thank their host families and their church communities, all in Sheboygan: Holy Name Catholic Church, Sheboygan Seventh Day Adventist Church, and Grace Orthodox Presbyterian Church. Thanks also goes to First Congregational United Church of Christ. This post is written by Lisa Vihos, the Director of Sponsored Programs and Research at Lakeland College. The program is made possible by the generous support of the American people through the United States Agency for International Development (USAID). The contents of this blog are the responsibility of Lakeland College and do not necessarily reflect the views of the USAID or the United States Government.